Neroth has reclaimed his own. After a century of rule, the Dark apostate of Canceri has relinquished his claim upon this mortal coil and passed into oblivion. Shadows cluster among the vaults of the capital city of Nishanpur as the Nihang of the Church of the Dark Triumvirate gather to intrigue for dominance over the unquiet soul of the land. Into this passion play of fiends and vipers enter the players, in their quest to uncover lore not meant for the eyes of mortal men, to make a choice... between unspeakable evils. 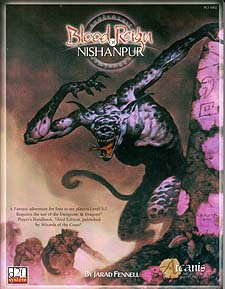 Blood Reign of Nishanpur is the second part in the Canceri Chronicles, a series of adventures that focus on the malevolent nation of Canceri. This second installment in the trilogy plunges the players into the heart of this wicked nation as they desperately search for the Black Book of Ymandragore, a Tome of Unspeakable Horror, and are drawn into an intricate web of deadly intrigue. A Fantasy adventure for four to six players Levels 5-7.